The other day, I had the opportunity to attend a session run by Department of Education and Training (DET) exploring EDUSTAR and looking at ICT planning. The program came about after a government audit found that although over time schools have been provided with adequate software and hardware, there has been little growth in regards to pedagogical practise and growth. What was interesting was the message that there is no expectation about where schools are to be in regards to eLearning. Every school is a different context. Data and analytics is gathered through various surveys and censuses to create a unique story. The reason there is no benchmark is that technology should not be a competition, focusing on which schools have what, instead it is about what practises schools have in place. For some this might mean 1-to-1, while for others it might be something different. It all depends upon the outcomes that are trying to by achieved. For as Michael Fullan states, “pedagogy is the driver, technology is the accelerator”. The question though is what are we driving towards? What was interesting is that although there was no benchmark for technology, again and again reference was made to the notion of ‘best results’. 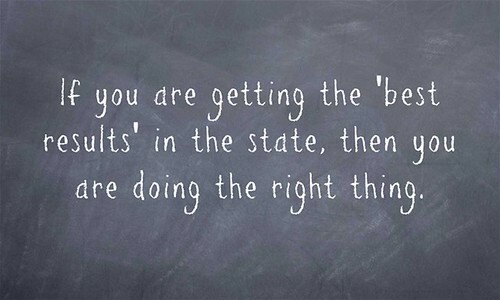 It is summed up in the comment from a fellow participant who said, “if you are getting the ‘best results’ in the state, then you are doing the right thing.” This got me wondering whether technology is often canned because it does not actually cater for the results that are often focused on by schools through annual implementation plans and NAPLAN results. In a recent post, Richard Olsen’s touched on the importance of what we measure and how we do it, that ‘success’ is not always as obvious as it seems. This reminded me also of Yong Zhao’s argument that we often measure the wrong thing. Instead of focusing on such traits as creativity and entrepreneurship, we focus on prescribed content and compliance. Where this difference stood out the most is through the discussion of an eLearning vision. The School ICT Progression Strategy is about supporting schools in generating a plan, creating a vision and setting goals. Although an improvement on before, to me there is still an elephant in the room. That of pedagogy. With every state school in Victoria supposedly mandated to have a clearly defined instructional model and continuing to use measurements associated with compliance to ascertain success, what is often overlooked is how eLearning marries with pedagogical practise. You can have as many c’s as you like in a vision, but if this is not linked with what is actually happening in the classroom then what is the point? Fine, technology has the potential to make what we have been doing more doable, as Bill Ferriter has suggested, but I question whether such processes as critical thinking and collaboration are at the heart of every teacher’s practise? For some it is tests, recall and maintenance of an essentialist curriculum. Paul Tozer once remarked to me, “what is valued by the system needs to change if what is happening in the classroom is to change.” I am not sure if that means a revolution, reform or renaissance, but something needs to change if we are really to get the best results for all learners. Although counting how many computers schools have in the classroom can be helpful for some, I am not sure if this is the right thing school’s are looking for? Doing the Right Thing by Aaron Davis is licensed under a Creative Commons Attribution-ShareAlike 4.0 International License. I’m not a huge fan of the statement “pedagogy is the driver, technology is the accelerator.” Technology should be more accurately seen as the enabler. Without technology many innovative pedagogical approaches are not possible at all. For example, technology doesn’t accelerate the ability to engage in networked writing, such as we do with blogging, it makes it possible, without technology it isn’t possible at all. But I agree with you, that we need to find better measures than NAPLAN if we want to redefine what doing the right thing is. Thanks for the comment Richard. You make a good point about ‘accelerator’. I am really interested in the notion of ‘enabling’ is that your own term or does that come from somewhere else? Do you have any further references for it? In the end, my point is still the same. Technology itself should not be at the front and centre. It in itself should not be the driver. It is not the why, instead it is the what. I’ll be attending this same planning session next Tuesday Aaron. I’d say there is a herd of elephants stampeding in the room, not just one. Indeed as Richard Olsen’s post you refer to contends, success or otherwise is often more about the ruler you are using to measure it than it is about actual success. If you focus upon nouns – the gadgets – instead of the verbs – what you are doing with them – you are using the wrong ruler. I like the point about the ruler Alan, look forward to your perspective. Maybe I missed something, but as you say, too many elephants left to too few.